I started my day yesterday with a smoothie. 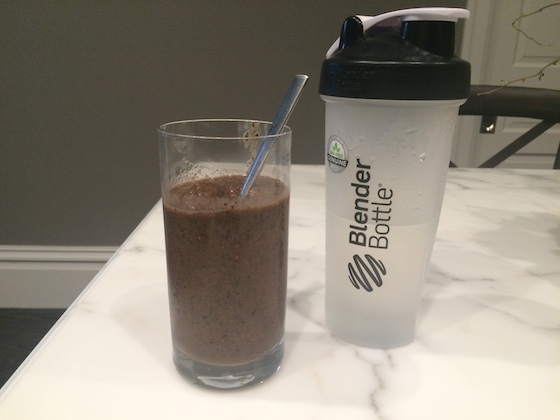 I finally picked up a single serving blender and it makes smoothies super easy! I added half of a banana, some frozen blueberries and raspberries, lots of spinach, and about a cup of almond milk. It was refreshing and chock-full of produce. 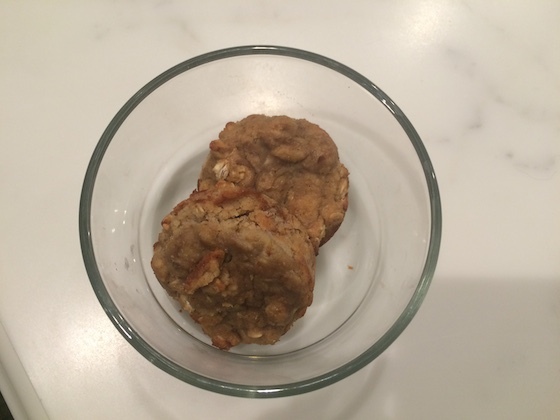 Once I got to work I enjoyed a couple of my banana peanut butter oat muffins. They were super yummy and kept me full all morning. I’ve only got a couple left, so I’ll have to make another batch soon! 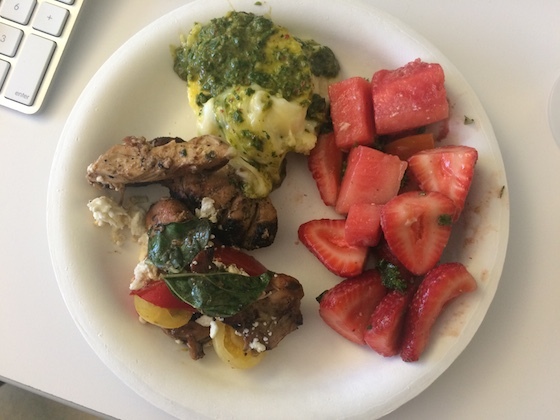 Lunch was chicken, polenta with pesto and fontina, and a strawberry and watermelon salad. I really enjoyed the fresh summer fruit. I’ve loved fruit my entire life, and strawberries are one of my very favorite. I haven’t been eating as much fruit as I should recently – I think I need to make seeking out a greater variety of fresh fruits a priority during grocery shopping. 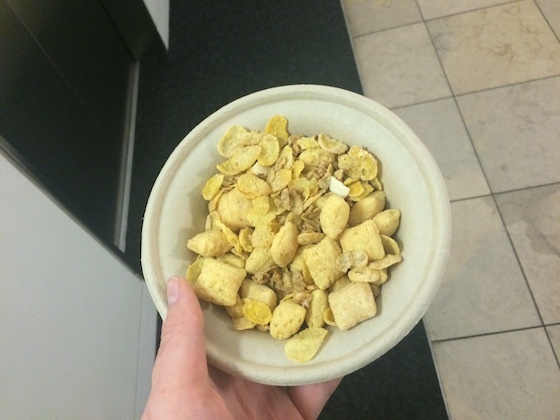 I took a break from work mid-afternoon to snack on some dry cereal. It was the perfect fuel for my workout later that evening. When I finally got home I spent some time preparing breakfasts for the rest of the week, and hunger definitely snuck up on me. By the time my dinner was ready, I was starving. 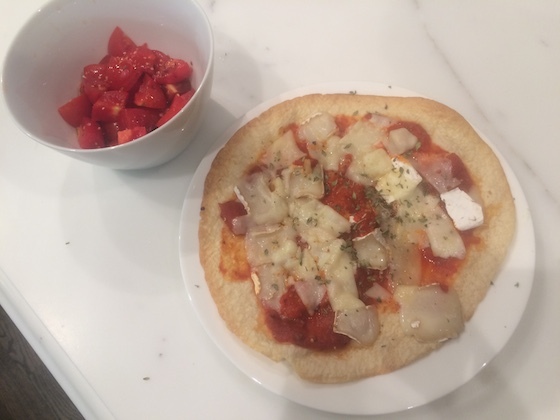 I threw this faux-pizza together with what I had in the fridge. I simply crisped up a tortilla in the oven for a few minutes, then topped it with tomato sauce, roasted pepper spread, and some brie and parmesan. I put it back in the oven until the sauces were warm and the cheese was melted. On the side I enjoyed some fresh tomatoes with olive oil and balsamic. It was simple yet delicious! 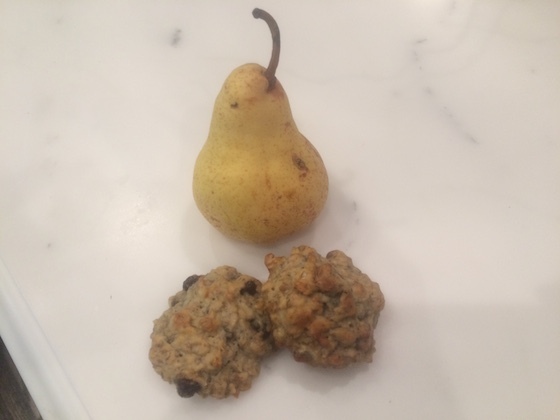 To cap off the night I enjoyed a perfectly ripe pear and a couple of these delicious healthy chocolate chip banana bread cookies. I made them on Sunday and guys, they’re amazing! Let me know in the comments below if you would like to see the recipe.